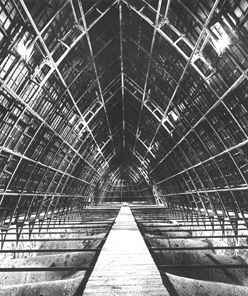 The cathedral’s remarkable cast-iron roof structure encloses an impressively large attic space roofed with copper plates. The copper roof creates a striking effect when the cathedral is viewed from a distance in the Beauce countryside and remains today one of Our Lady of Chartres’ distinguishing features. Of all of France’s cathedral labyrinths, the Chartres labyrinth is the only one to have survived in situ. it is a monumental stone inlay of limestone bordered by strips cut from midnight blue marble. It is 12.89 metres in diameter and the path through the labyrinth is 261.5 metres long. The brass plaque from the middle is missing, having been melted down along with the bells in 1793 to make canons. The battle between Theseus and the Minotaur depicted on the brass plaque was a reference to the famous Cnossos Labyrinth on Crete. These labyrinths were generally known as daedaluses in a reference to the architect of King Minos, regarded as the greatest architect of Antiquity. This was why architects were given to signing their work by adding their name or even their portrait to these labyrinths. The Chartres labyrinth was known as ‘the league’ since following the path through it on one’s knees took the same amount of time as walking a league along a road. The path symbolises the journey of human life leading to ultimate victory over Evil. 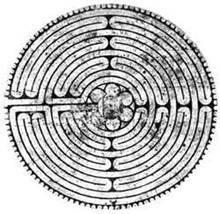 The Christian labyrinth thus has a very different meaning to the labyrinths of Antiquity: it represents the journey to Christ’s salvation, not a puzzle in which to lose oneself. In the corner formed by the south transept and the side aisle of the nave there is an angled grey flagstone containing a nail. Half way up the stained-glass window opposite, a clear piece of glass lets a shaft of light through. In 1701, Canon Claude Estienne created this arrangement to ensure that cathedral’s clocks kept the correct time. On the 24th of June, the feast day of St John the Baptist, the shaft of light hits the nail precisely a few minutes before 2 p.m., taking into account the position of Chartres relative to the Greenwich meridian. This pear-wood statue dating from around 1510 was previously mounted against the rood screen, which was taken down in the 18th century. Still highly venerated today, it is on display in a chapel of the ambulatory. A short curved corridor running through the 11th-century crypt, which once formed part of the infrastructure of the north transept, leads to the Chapel of Our Lady of the Underground. 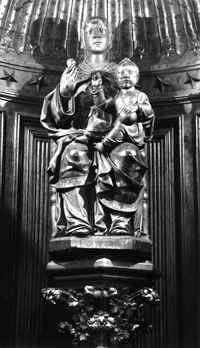 The statue by the sculptor Fontenelle erected there in 1857 was replaced in 1976 by a new statue of the Virgin in Majesty carved in walnut that is a slightly smaller copy of the original statue, which was moved to the Carmelite monastery. Carved in a much plainer and more austere style than the one that stood there in the 19th century, it serves as a reminder of the Romanesque statue of the Virgin which was burned by revolutionaries on the 20th of December 1793. 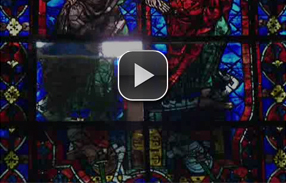 This chapel where the faithful come to pray fervently is for many the cathedral’s true sanctuary. This well, which is square in cross section in its lower part, is thought to be of Gallo-Roman origin. It is 33 metres deep, reaching the water table at the level of the River Eure. These days it is generally more or less dry. Initially sited outside the first churches on the site, it was later incorporated into the crypt. This place was once known as the ‘Strong Place’, which evolved into the name the ‘Strong Saints’ from claims that the corpses of the first Christian martyrs had been thrown down it. The well water was reputed to be miraculous, curing believers of ‘Saint Anthony’s Fire’ (thought by some to be the nervous disease known today as ergotism and by others as a kind of gangrenous erysipelas). The well is thought to have been filled in in around 1200 when the current cathedral was built, probably as a precaution when sinking one of the piles taking the weight of the high Gothic vaults very close by. Covered over by building work in the 17th century, it was revealed in 1901 following a careful excavation. The top eight metres had been demolished; consequently, all of the well’s top section is modern. The Treasury, previously situated in the Chapel of St Piatus, is not open to the public today. A new plan to open it to the public is currently being considered by the Centre Region Cultural Affairs Directorate.